Germany Opens Formal Inquiry Into Tapping Of Merkel's Phone : The Two-Way Germany's top federal prosecutor has opened an investigation that won't focus on wide spying activities attributed to the U.S. National Security Agency. German Chancellor Angela Merkel at a session of the Bundestag Lower House of Parliament in Berlin Wednesday. Germany's top federal prosecutor told legislators today that he is opening a formal inquiry into allegations that the NSA tapped her phone. Germany's top federal prosecutor is investigating allegations that the U.S. National Security Agency tapped Chancellor Angela Merkel's cellphone. The inquiry won't focus on wide spying activities attributed to the agency, which allegedly included snooping on data connections and companies in Germany. As newspaper Deutsche Welle reports, the public announcement is a reversal from last week, when it seemed the prosecutor wouldn't pursue the case. "Chief federal prosecutor Harald Range has been under increasing public pressure to investigate NSA surveillance in Germany. 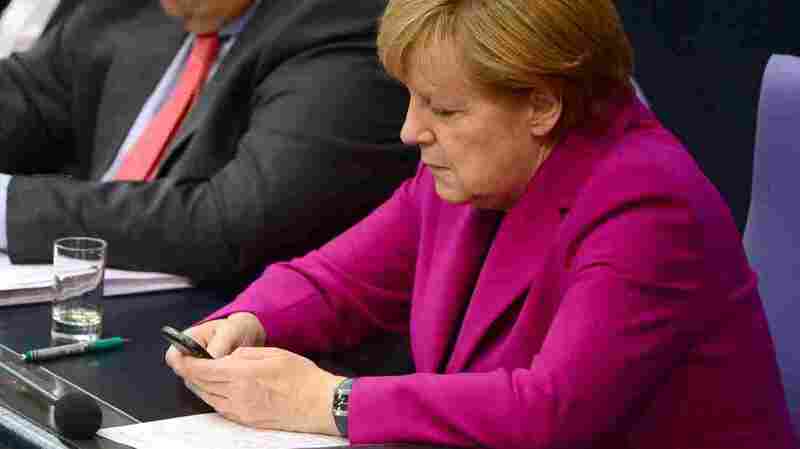 But the formal probe he announced to the German Parliament today will be limited to the bugging of Merkel's cellphone. "The chancellor has repeatedly demanded an explanation from Washington about the alleged tapping of her phone, but never received one. "That allegation, along with revelations of U.S. agents conducting widespread phone and Internet surveillance of Germans, has strained relations between Washington and Berlin. "The NSA is also accused of tapping the phone of Merkel's predecessor, Gerhard Schroeder, after he spoke against then-President Bush's calls for war in Iraq." As you'll recall, charges about NSA spying on Merkel arose in October, relying on documents leaked to the media by former agency contract worker Edward Snowden. President Obama has said the U.S. isn't spying on Merkel.